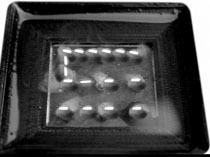 Researchers at Swansea University and the University of Sussex have invented ways to use liquid metal to create tactile effects and display physical shapes. The scientists applied electrical charges to manipulate liquid metal, using pulses and movement of droplets to create a new type of tactile feedback. They also used the system to form the metal into 2D shapes such as letters and logos. As shown in the images below, these can either be large droplets of metal that are morphed into patterns, or smaller drops that are animated to create similar effects. A large droplet of liquid metal morphs into the letter S using programmable electrical charges. A single drop moves to animate a similar S shape. The team says the findings represent an “extremely promising” new class of materials that can be programmed to seamlessly change shape. This opens up new possibilities in “soft robotics” and “shape-changing mobile devices”, the researchers say. While the invention might bring to mind the film Terminator 2, in which the villain morphs out of a pool of liquid metal, the creation of 3D shapes is still some way off. More immediate applications could include mobile devices with fluid elements, and reprogrammable circuit boards. The electric fields used to control the liquid are created by a computer, meaning that the position, shape and animation of the liquid metal can be programmed and controlled dynamically. Professor Sriram Subramanian, head of the INTERACT Lab at the University of Sussex, who collaborated on the work, said: “Liquid metals are an extremely promising class of materials for deformable applications; their unique properties include voltage-controlled surface tension, high liquid-state conductivity and liquid-solid phase transition at room temperature. The research was presented recently at the ACM Interactive Surfaces and Spaces 2017 conference in Brighton, and the ACM Symposium on User Interface Software and Technology in Québec City. This is a joint project between Swansea and Sussex funded by EPSRC on “Breaking the Glass: Multimodal, Malleable Interactive Mobile surfaces for Hands-In Interactions” (EP/N013948/1).